Journalists, activists, and other civil society actors play a pivotal role in building a transparent system of governance in any society. The UN Declaration on Human Rights Defenders* affirms that everyone, individually and in association with others, has the right to submit to governmental public bodies, criticism and proposals for improving their functioning, and to draw attention to any aspect of their work that may hinder or impede the promotion, protection, and realisation of human rights and fundamental freedoms. In Ethiopia, many journalists, HRDs, and political figures have endured varying degrees of targeting by authorities including arrests, intimidation, and torture, making their work very difficult and, at times, altogether impossible. This report assesses the overall situation of HRDs in Ethiopia and examines the government’s repression of dissent, particularly since the introduction of three restrictive laws almost a decade ago and in light of current developments. The Ethiopian government has made considerable strides in economic development since coming to power in 1991, which has attracted international recognition and acclaim. Ethiopia, as the seat of the African Union (AU), is also a key political figure on the continent, and partner to many in the fight against terrorism in the region. Shortly after the highly controversial 2005 national elections, the Ethiopian Parliament enacted legislation that further narrowed civic space, notably: the Charities and Societies Proclamation, Mass Media Proclamation, and the Anti-Terrorism Proclamation. These three laws were criticised for their restrictive provisions, which limit the work of journalists, HRDs, and civil society organisations (CSOs) through broad language and severe punishments. At least 27 journalists and HRDs (excluding the ones charged in absentia) have been charged and some convicted to lengthy prison terms because of the nature of their work since then. However this number only represents the known cases that were brought before a judge and prosecuted, and does not include cases where HRDs were not officially charged. Over the past two years, Ethiopia has been rocked by growing protest movements in different parts of the country, notably in the two most populous regions of the country, Oromia and Amhara, and to a lesser extent the Southern Nations, Nationalities, and Peoples’ Region (SNNPR). Although their immediate causes differ, protesters in all regions claim they are in practice being marginalised from participation in key economic and political affairs despite the government’s ethnically-based federal structure and regional devolution. Security officials responded to mass protests in Oromia and Amhara regions with excessive force, which resulted in the killing of over a thousand people and the arrests of tens of thousands of demonstrators since 2014. These actions triggered timid condemnations from Ethiopia’s key partners and outcry from international human rights bodies. The widespread and deadly protests led the government to declare a State of Emergency that lasted 10 months, the first of its kind under the current government, which has been in power for over 25 years. 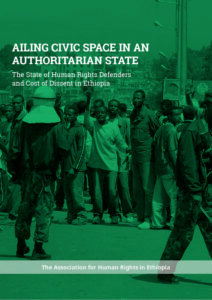 This report aims to document the growing restrictions on civic space in Ethiopia, which, in many regards, can be seen as one of the causes of Ethiopia’s current political crisis. Civic space represents a forum for citizens to express their opinions and grievances, engage in a dialogue with authorities about governance issues, and is occupied by HRDs and other actors looking to express views on and participate in public affairs. Thank you for your taking on this challenge. Most of us spend our energies on petty items while Tplf continues to loot the nation and sow discord. You need to bring together Ethiopians of diverse backgrounds and analytical skills to address issues of the day. Here is what I mean. We all know maid service to Arab countries and child adoption have been a booming cottage industry run by Tplf and Tplf-favored individuals. There are over 2million young women working in Arab countries for a little over $200 per month. That is a fourth of the base wages. A little over 7,000 children have been adopted for a sum of nearly $300 millions. Where do you think have those monies ended up? “Ethiopia lifts ban on domestic workers moving overseas” reads today’s news. (see News24.com) Do you see how Tplf phrased it? The same Tplf that made a business out of indentured servitude of Ethiopians is trying to tell us it is now out to protect the rights of Ethiopians. Just two weeks ago a statement by Tplf read “Ethiopia bans foreign adoptions”(see bbc.com/news). Do you now see what is happening? This is a disinformation campaign that groups like yourself need to match. We simply can’t continue to speak without understanding what is going on and without prioritizing issues. Thanks.